More and more choose our Everblue Pavers as a great alternative to Bluestone Pavers. The long-term performance and slip-resistance of Everblue make it an excellent choice for many applications from Patios to Pools and Roof decks. No Shaling. No Callbacks. No Maintenance. Everblue™ Everblue Pavers can be installed on both a sand base and a wet set. A sand base install will allow you to adjust the Everblue™ Pavers with ease. However, in the long run, using a sand base will cause the porcelain pavers to move with the ground unless secured with edge restraints. While a wet set installation will cement the Everblue™ Pavers in place preventing any movement. 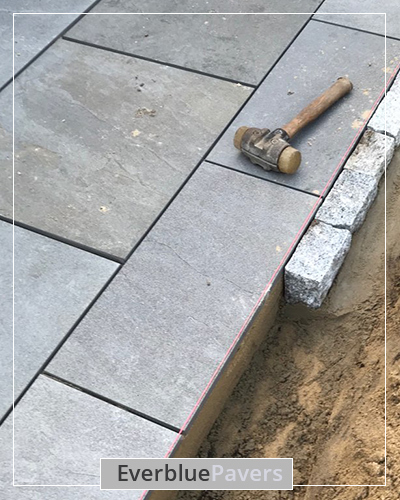 Adjustment in the positioning of the Bluestone Pavers would require you to pry them out for repositioning. In addition, due to Everblue’s™ density, the pavers never need to be sealed. They will not age overtime. Durable. Built for the Elements. 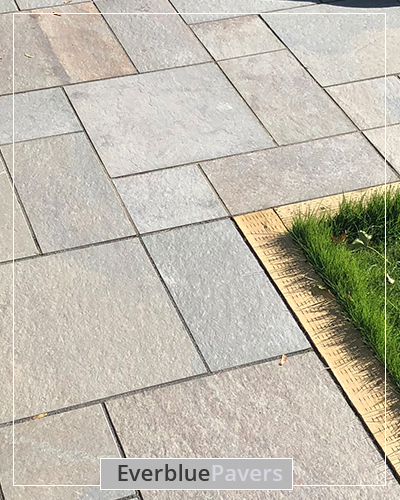 Unlike Natural Bluestone, our Everblue™ Pavers are designed to withstand the elements, including harsh regions with freeze thaw challenges. Over time, natural bluestone pavers will change with its environment making it prone to fading, shaling, and staining. Everblue™ will not shale, fade, or scratch. 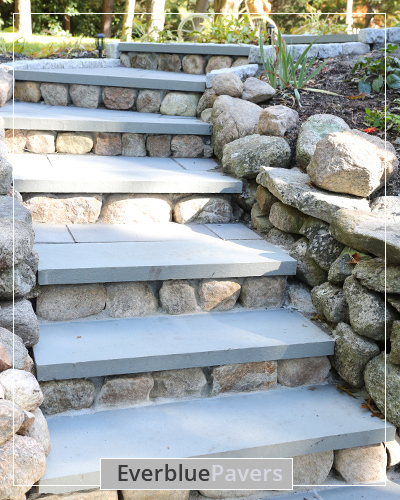 Natural Bluestone requires constant maintenance with no guarantee of longevity. Everblue™ on the other hand, requires no maintenance and will last forever making it an excellent bluestone alternative. Beveling is a process where a portion is taken off the face edge of the Porcelain Paver at a 45 degree angle. 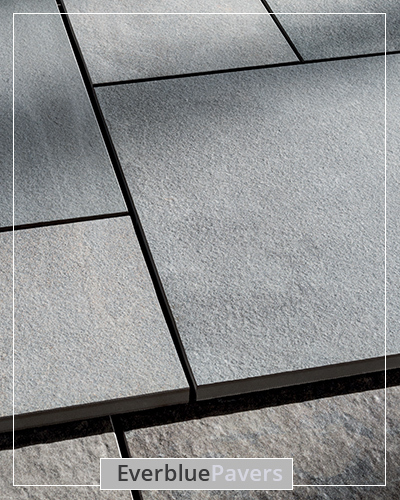 Our Everblue™ Porcelain Pavers are beveled to reduce the amount of chipping that may occur during installation. If any damage does occur, it will not be noticeable when the installation is complete. Treads and Coping available. Please contact us for more details. We Offer Wholesale and Dealer Pricing. We’re here to help! Feel free to give us a call at 1-888-726-3963 and our always-friendly customer service team will answer any questions you might have. Or, if you prefer, fill out our contact form here.